Dating back to the 16th century, the lawn generally referred to a managed grass space for aesthetic and recreational purposes. Tied to suburban expansion and the creation of household aesthetic, the lawn gradually became an important interaction link between the natural environment and the constructed urban space. Living in a densely populated city like Singapore where space is highly limited, it would be considered 'atas' or luxurious if you own a lawn at the back of your house and have your own BBQ sessions with family and friends on an odd day but what about the less privileged? Well...keep reading! 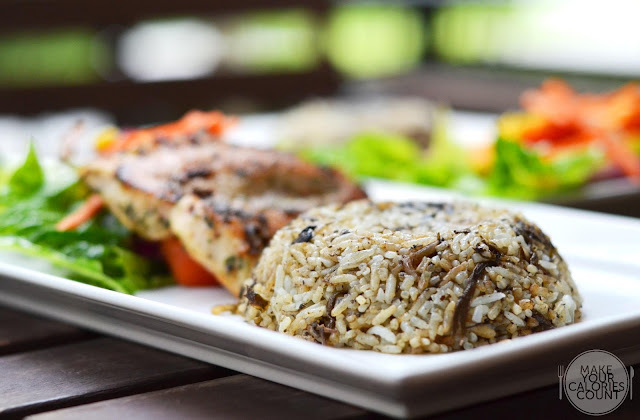 What we recently discovered was a hidden gem nestled among the high rise office buildings at Biopolis which offered exactly that casual dining experience at the back of a beautiful landscape illustrated with water-flowing features and lush greenery. Singaporeans, myself included, would more commonly regard this part of the island as a biomedical research hub. 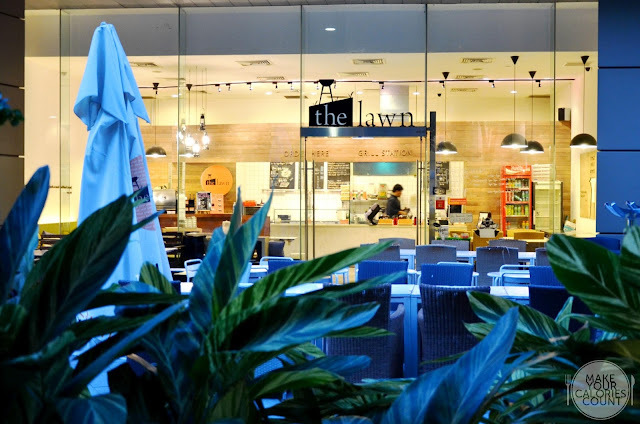 It is no coincidence however that boutique cafe, The Lawn, decided to land foot its operations here back in November 2011. 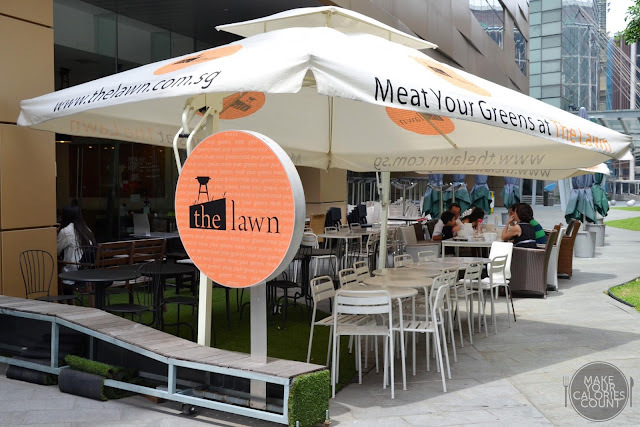 With an intention to introduce a brand new concept to the Singapore F&B scene, The Lawn focus on serving bang for the buck calories-worthy salad and grill dishes in a relaxed setting. It might seem like an awkward fit initially being able to dine on the astro-turf patio alfresco-style but on hindsight, we felt that it was provocatively interesting and unique! After all, life is stressful enough as it is and some surprising elements in the middle of urban land can only surely titillate! 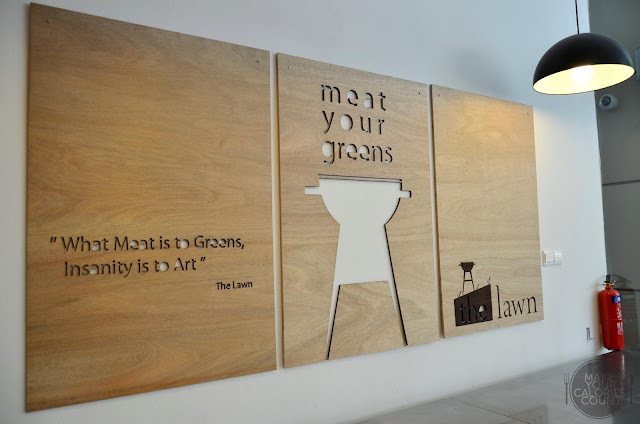 With a tacky tagline - 'Come Meat Your Greens', we were intrigued by what this speciality grill and salad cafe had to offer. Can healthy eating be good tasting and interesting? Lets find out! Spoilt for choice, we requested for recommendations from the friendly servers and were suggested the fish fillet as my protein for the dish. The stronger flavoured Italian parsley was chosen over the curly counterparts. The fresh and 'grassy' flavours of the herb appeared slightly masked by the cardinal flavours stemmed from butter and Kosher salt though it lingered in the after taste. This dish would certainly appeal to those with a savoury appetite. Coming fresh off the grill, the flesh of the fish was tender and nicely complemented by the slightly crisp char-grilled bits. A Teochew at heart, there was an inkling of nostalgia which trickled down the back of my throat with that beautifully cooked pickled Chinese olive rice (kana chye). It must have been at least 2 decades ago when my grandfather used to prepare this dish for us before his passing. The introduction of carbohydrates to the dish was to offer hungry diners an alternative to mere salad which could make a more filling meal. Adopting a secret recipe that of the owner's mum, the rice was so good and addictive that quite frankly, I wouldn't mind enjoying it as a main on its own! The rice was cooked al dente and the grains could be separated easily. Despite so, it was not too greasy and the flavours were bold and robust. We were split about the salinity of the dish for personally I found it a touch too strong for my palate (though I admit to having an acute sharpness to flavours) while my other dining companions enjoyed it the way it was. The accompanying side salad was fresh and offered a good crunch and crispness to the grilled mains. Being a fan of salad dishes, I am very particular about the quality of salad served and its freshness. Well, I suppose anyone would frown upon wilted leaves with brown edges? The Lawn certainly passed the quality test on this accord! This was one of their more popular dishes on the menu and we decided to give it a shot. 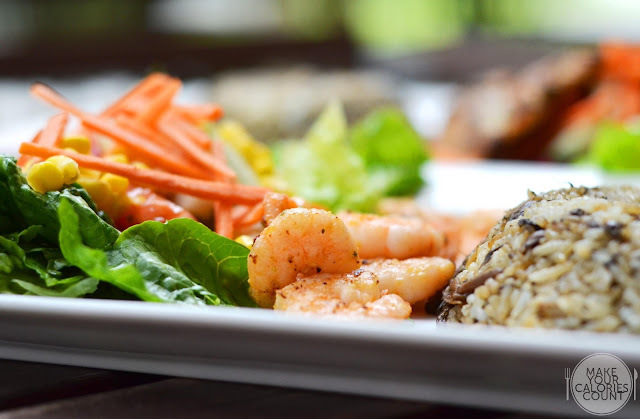 The prawns were carefully marinated with their special concoction of herbs and juices before landing on the flat grill. We enjoyed the balance in flavours with an initial punch of saltiness subtly neutralized by a mild sweetness. The finely diced garlic gave a neat dose of fragrance to the seafood and in general it was a savoury dish well-paired with the olive rice and salad sides. The dishes were freshly made to order on this flat-grill. The metallic covers helped to speed up cooking time and more importantly to allow the grilled proteins to retain moisture. While the prawns lacked firmness in terms of texture, it was succulent and the marinade paid off on our palate. 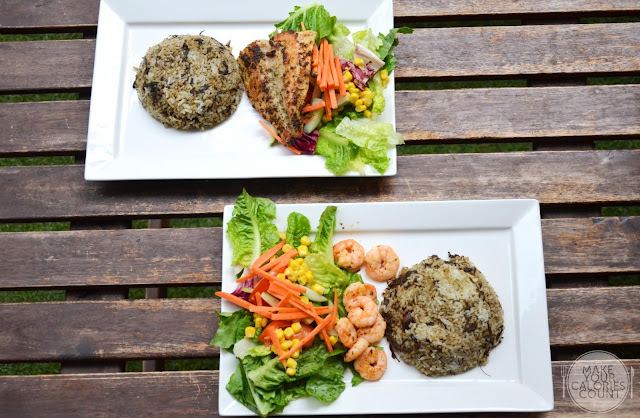 Having tasted the savoury rice dishes, it was time to put the salad dishes to a test. Admittedly, this was one of the few if only place to serve a portion that generous that even I struggled to finish the dish. Paying close attention to the most minute details, each salad dish had 100 grams of Romaine lettuce salad with an additional 25 grams of assorted salad leaves. 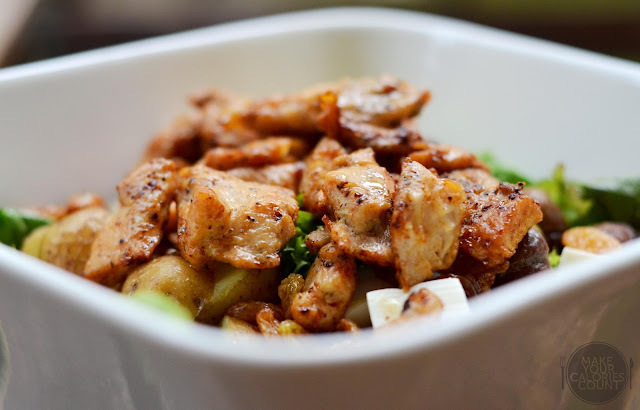 This was topped with a generous 125 grams of freshly grilled chicken breast, which had been sliced to bite-sized portions. Calling out to all the fitness enthusiasts out there, this is your answer to a post-workout meal, complete with low carbs and high protein (at least 26 grams of good clean protein!) 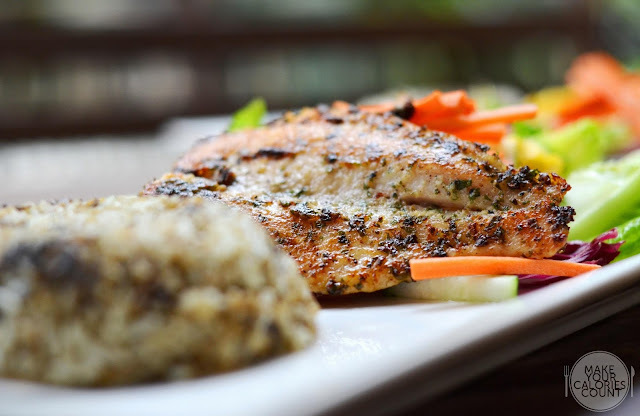 We would highly recommend for diners to consume this fresh where the well marinated chicken breast portions tasted tender and soft with a beautiful thin coating of maple syrup to give a saccharine oomph, sweet enough to please and not satiate. The sinful indulgence was balanced with the bed of fresh salad which tasted clean and crisp. The fun part was where we got the opportunity to choose 5 toppings and a dressing of our choice, so let your creative juices flow in trying to find the best combination to go with your greens and protein. We went for chestnut, sweet corn, tofu, baby potatoes and raisin and together it was an interesting mix which left us satisfied! With a 'Create-Your-Own' salad menu, I thought it was important to get the combination of main and sides right in order to nail the balance in flavours. It might be a bit tricky so if in doubt, consult the friendly servers like we did! In addition to the choices available under the 'Classics', there was the 'Premium' category of protein which carried interesting names such as Grilled Salsa Duck and the two beef dishes which we tried. Originated from Modena and Reggio Emilia (in Italy), the Aceto Balsamico vinegar was a true traditional rendition, aged for at least 12 years. If you are a fan of good balsamic vinegar, you would taste the sharpness almost instantaneously upon the first bite. It was rich, glossy, deep brown in colour and had that beautiful complex flavour that balanced the natural sweet and sour elements of the cooked grape juice with hints of wood from the casks. Admittedly, it was quite a waste that the portioned Sirloin beef spent a tad too much time on the grill and was slightly overcooked. 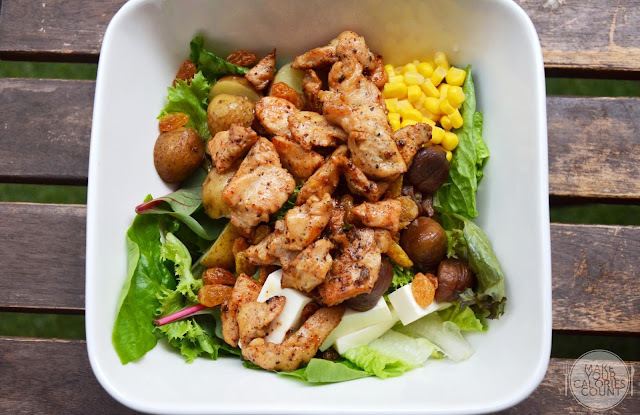 The ingredients put together were of premium quality and would certainly be a must-try for foodies who have a preference for vinaigrette dishes. Upon being served, our senses were highly stirred by the aroma of this special Sirloin beef dish named after a close friend of the owner. No prizes though for guessing that the recipe came from the mystery friend, Ben! A dry rub with a combination of salt, pepper, sugar, herbs and spices had been added to the meat and unlike liquid marinade, dry rub forms a crust on the exterior of the meat when grilled. The salt component of the rub would draw out the succulent juices in the steak, resulting in a moister bite. Upon being grilled, the sugar caramelized to form the thin layer of crust to seal in the flavour and juices. Seriously, how can you say no to this? It was beautifully grilled and this time round, the chef nailed the cooking time and everything was spot-on - the flavours and texture just came together neatly. Every mouthful was a flavoursome chew and being the owner's favourite dish, it would be hard to go wrong on this! 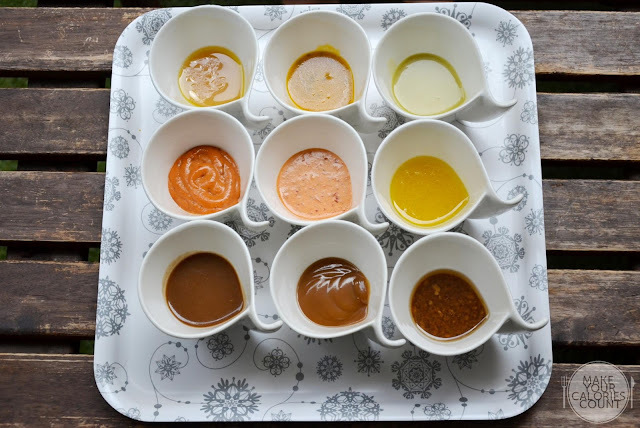 We were very privileged indeed to have the opportunity to try all 9 of their dressing offerings. 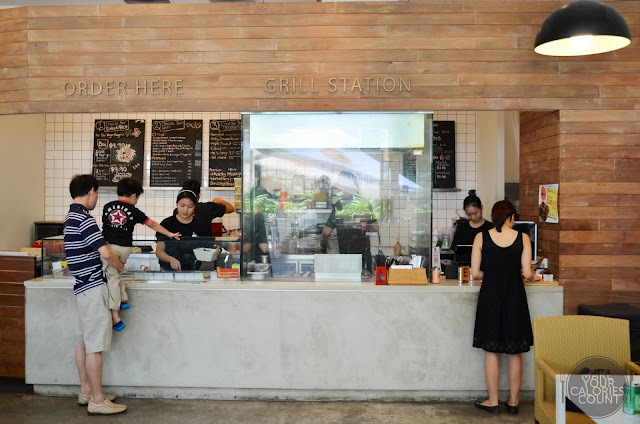 For all the dishes, diners have the option to choose a classic dressing to go along while premium dressings such as the ones in the top row of the picture above have an additional charge of S$1. Let me do a quick run down. Beachy Peachy: You could taste the grainy bits of the peach fruit and there was a subtle sweetness to it. It tasted fresh and as if it was from those with a velvety skin. I was half-expecting it to be the canned peaches soaked in syrup but I was in for a pleasant surprise! Manly Mango: Any fans of fresh mango fruit should love this. We loved the natural sweetness of the fruit yet leaving you with a mild tinge of sourness that bites, sharply. Thumbs up! Wasa Honey: I was captivated upon the first dip and started scurrying more to taste. The heat from the wasabi was minimal and if any, it was well neutralized by the sweetness of the honey. One of my faves! Red Island: This tasted similar to the classic Marie Rose prawn cocktail dressing but with a heavier touch of the tomatoes. A beautiful blend of tomato purée and thousand island sauce, this was a rich and vibrant dressing though for the calories-conscious, do watch out! Me So Spicy: This was one of my top-ranked dressings! I was warned that this dressing packed a good punch of heat but I would highly recommend it for any fans of Tom Yum! It had an interesting fusion twist when drizzled across the fresh salad and personally I enjoyed it the most. While it tasted good, the dressing should pack some wicked amount of calories in it just like the Red Island due to the creaminess. Citrus: The name said it all really. If you were after a refreshing burst of flavours, opt for this. On the plate of salad, it tasted light yet rich with flavours. Honey-Ball: This would be a classic salad dressing if you really could not make up your mind. 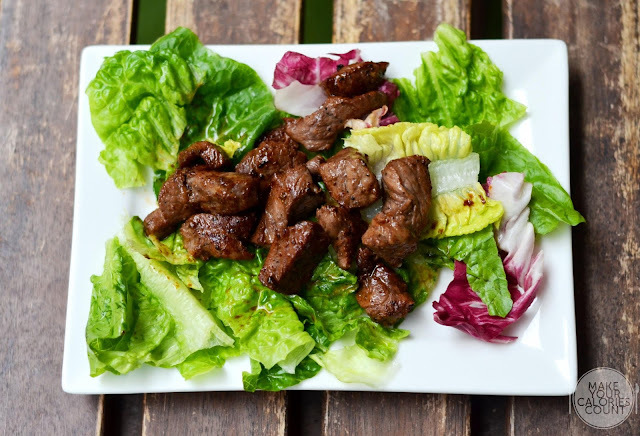 We enjoyed the nice mixture of balsamic vinaigrette and mustard and this would certainly create a stir to your appetite and arouse your senses for the main grills! Maple Peanut: I am a fan of both peanut butter and maple syrup but when put together, the combination did not quite go for me though the ladies at the table adored it. Love-hate relationship I suppose. Perky Sesame Ginger: Personally, this did not go very well for me. Imagine the chicken rice dip drizzled over your bed of salad with sesame oil and ginger giving a solid kick of flavours. Standalone, it tasted amazing and probably better than some of the concoctions the chicken rice hawkers have out there but on the salad...it did not work for me unfortunately. I do have to confess that on any given day, I would take my salad clean and neat without any dressing. In fact, it is a habit since young. Having tried the fresh dressing offerings, I am actually tempted to make a change for the flavours really impressed me. 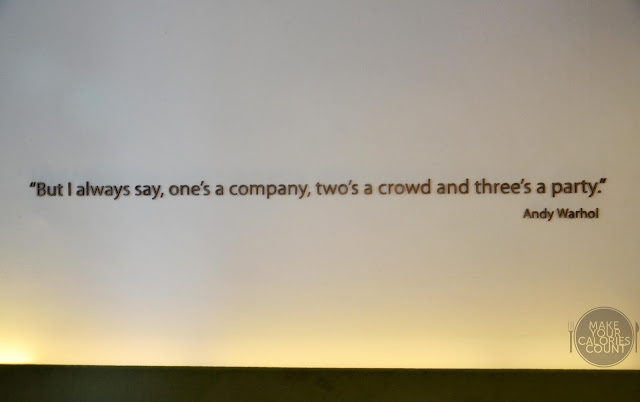 We loved this beautiful quote by Andy Warhol which accurately captured the essence of our spirit of food-tasting in group of three. Live up the ambiance, eat some good food and throw a party! Upon placing the orders and choosing your salad, you move on to make the payment further down the line on the right. What we really liked about the place was the open kitchen concept where you would witness your food being freshly cooked before you! With copies of lifestyle magazines readily available for dine-in customers, feel free to take one, grab a seat and laze the afternoon away to some delicious salad and grill! 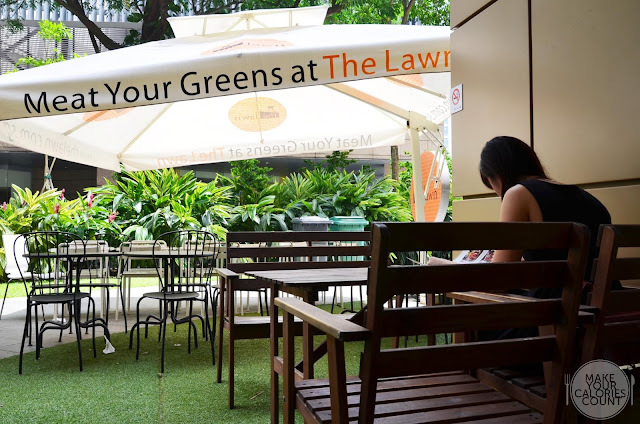 It was in general a very enjoyable dining experience at The Lawn. The staffs were a dynamic and youthful bunch who were friendly and very approachable. The lady whom I spoke to was also very knowledgeable about the different menu offerings. In conclusion and to answer the question posed at the start of this entry, we found the food value for money and more importantly worthy of our calories! So yes, healthy eating can be delicious! That being said, I can be quite particular with my grill. 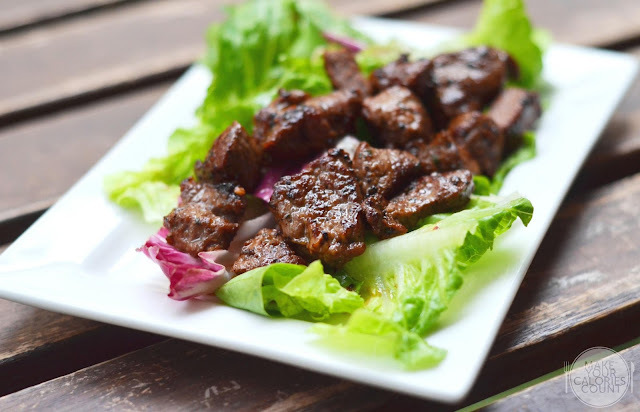 I was actually expecting the classic beautiful grill-lines to be slew across the protein but having served their meat in bite-sized portions and on a flat-grill, this would obviously not be possible. Do note that they also have an online store where orders could be made online! 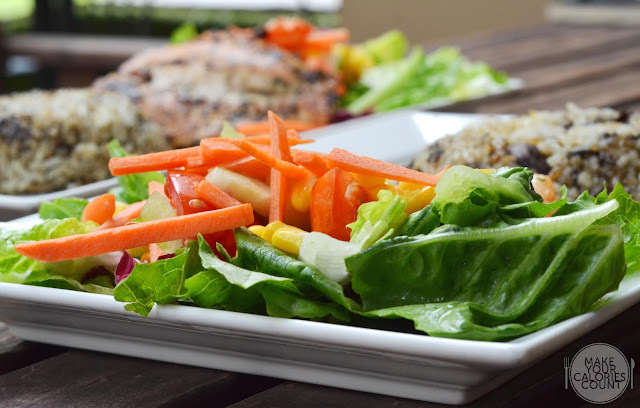 For the health-conscious, grill and salad seemed like the perfect solution to a good post-workout recovery or even just to pamper yourself with some good calories on any given day! While obviously there were hits and misses like any eatery, the featured signature dishes did The Lawn proud and we were most impressed with the dressing offerings, each tasting of fresh ingredients being used. We would like to express our appreciation to Jonathan who graciously invited us for this food tasting session but this write-up was done out of free-will without charges. As such, we enjoyed the liberty of customizing our meals. It would be worth noting that the rice portions in the photographs were actually reduced, so normal diners could expect an even more generous serving size! The lovely weekend afternoon was spent chattering away where we shared places of good food and basically talked about anything under the Sun! For fans of The Lawn, stay tuned to our blog, their website or facebook page for their upcoming lawn opening soon near you! hey chong, are you still in sg? do you wanna drop by our new outlet in shenton way? hey jonathan, thanks for dropping by. yep, i had actually moved back to SG recently but been tied-up with work pretty much. sure, that sounds good, when would be a good time? do you still have my number? would be good to drop me a line please!